* Distress strobe. 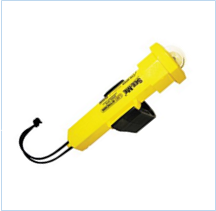 Virtually any of the large variety of distress strobes available on market would serve the purpose. 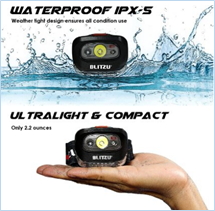 However, here are few key factors you will need to consider: weight, profile (avoid military grade or military-specific equipment unless you are law enforcement), power source (batteries that would not be interchangeable with other devices you use and/or heavy batteries), signal power (what is distance you are intending to signal at, check product specifications), water resistance. 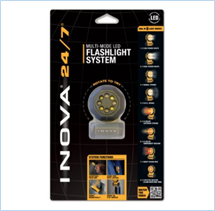 As back-up (or cheaper alternative) you may consider covering distress strobe functionality with flashlight (that has distress strobe function) and/or downloading smartphone app. * Air marker panel. 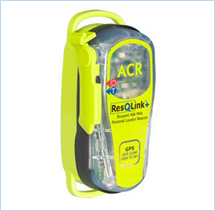 You may want to consider this option for environments where marking your location would contribute to your search and rescue (from air) or identification as non-combatant (where there is threat of militant actions). Be considerate of your profile if choosing military equipment. 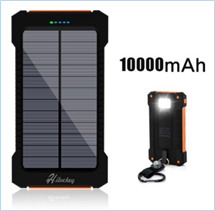 Lower profile and lighter solution could be orange emergency sleeping bag. * Torch with spare bulb. 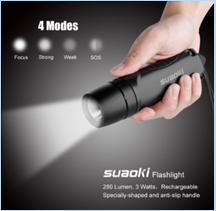 To consider when choosing torch, consider: weight, power source (batteries to be interchangeable with other equipment or hand powered), water resistance, light provided per on charge of batteries, additional function of distress signaling, red light filter if you want to remain less noticeable at night. 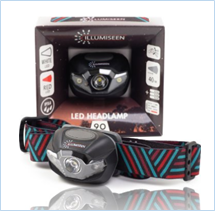 In addition to torch you may also want to consider headlamp for hands-free operation and/or mini torch/ key chain light for inclusion in your Survival Kit. * Glow sticks. Glow sticks have double function of signaling and providing light. They are always good to have, but might raise your profile unnecessarily in some contexts. If profile is not an issue, consider having 3-5 x 12 hours glow sticks as well as few mini glow sticks for Survival Kit. Plan for packing so they do not brake/ get unintentionally activated; placing in plastic tube would be most effective or packing against soft items (clothing, First Aid Kit) would provide some protection. * Waterproof notebook. Waterproof notebook is readily available on market. 3x5 inch is about right size. Of course you can use candle (cold rub against) to waterproof regular notebook, but quality will not be anywhere close. Here is a good sample: http://goo.gl/9iOyO. * Pencil. You may pack mechanic pencil, but simple wooden case pencil would do as well. Consider packing short wooden case pencil in Survival Kit (just break normal pencil in half and sharpen it). * Permanent marker pen. Black color would be preferred (more visible mark then green or blue, for example). Any quality, pen size marker is fine. Cone-shaped tip is preferred, so you can make marks of different width, as required. * Signal mirror. Signal mirror, also known as “heliograph” is used for directional signaling on distance (to air or land). 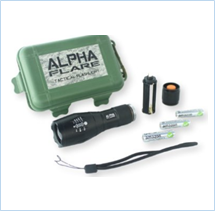 You can consider specialized signal mirror for effectiveness or signal “dog tag” for smaller size and weight. If you need to be low profile, ordinary pocket mirror would work; you just need to ensure you know how to use it (easy to look up techniques on internet), as you pack.